Donald Trump Responds to Jimmy Fallon's Regret over the Hair Tousle: "Be a Man"
Donald Trump's long, complicated relationship with NBC seemingly further deteriorated over the weekend thanks to a new interview in which The Tonight Show host Jimmy Fallon finally addressed his infamous 2016 interview and hair tousle with not-yet-president Donald Trump. 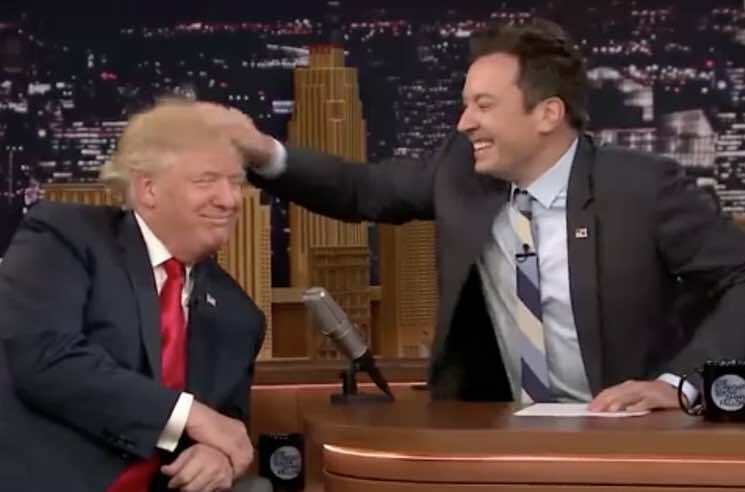 Speaking to The Hollywood Reporter for their Awards Chatter podcast last week, Fallon explained that his light-hearted head pat (which drew heavy public criticism) was not meant to "normalize" or endorse Trump and his political beliefs. Trump caught wind of the interview over the weekend, tweeting about Fallon's new stance on the infamous hair incident. He berated Fallon for "whimpering" and claimed that he would have done things differently in retrospect, and implied that Fallon had called him to praise the "monster ratings" generated by the episode. He ended the tweet by telling Fallon to "be a man."
. @jimmyfallon is now whimpering to all that he did the famous "hair show" with me (where he seriously messed up my hair), & that he would have now done it differently because it is said to have "humanized" me-he is taking heat. He called & said "monster ratings." Be a man Jimmy! The late-night TV host fired back, announcing that he would make a donation to RAICES "in honor of the President's tweet." The Texas-based non-profit organization provides free and low-cost legal services to underserved immigrant children, families and refugees. In honor of the President's tweet I'll be making a donation to RAICES in his name. Formerly the host of The Apprentice, Trump was dropped by NBC in 2015, following controversial comments about immigration. He went on to return to the network to host Saturday Night Live in 2015 during his presidential run, followed by the aforementioned appearance on The Tonight Show Starring Jimmy Fallon on September 15, 2016. Trump has continued to provide fodder for SNL, with Alec Baldwin portraying the president for the past few seasons. Dave Chappelle, who hosted the first episode of SNL following Trump's election win, later retracted his comments that viewers should "give Trump a chance."